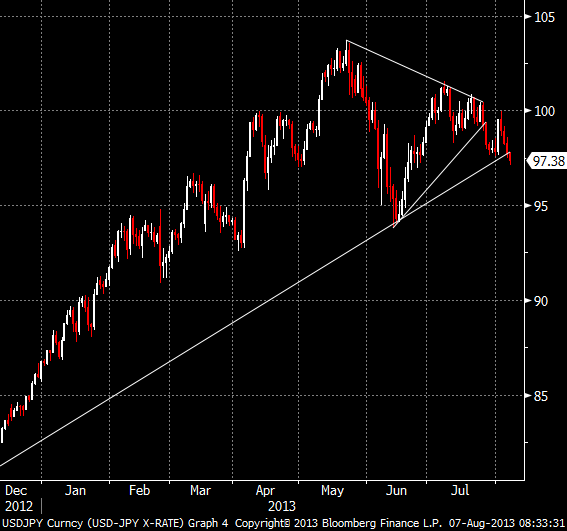 Having broken down, USDJPY has rallied back to “kiss” the old uptrend line which is now acting as resistance. 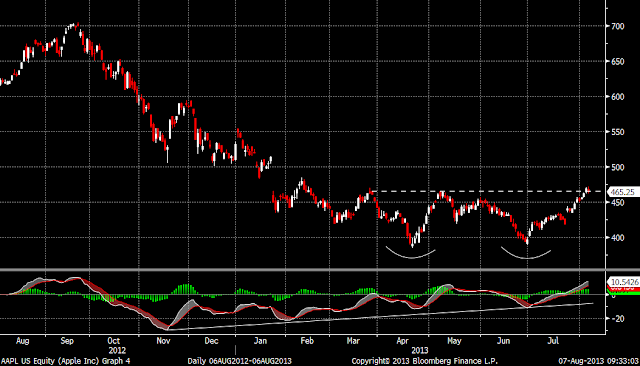 A strong Yen will make it hard for Nikkei – and in my view all risky assets – to rally. As I have noted before, USDJPY warrants close attention and is one of the key charts I am watching right now. Loss of momentum is easy to see on a 6 month chart of the S&P (see divergence on MACD and MACD histogram in chart below). 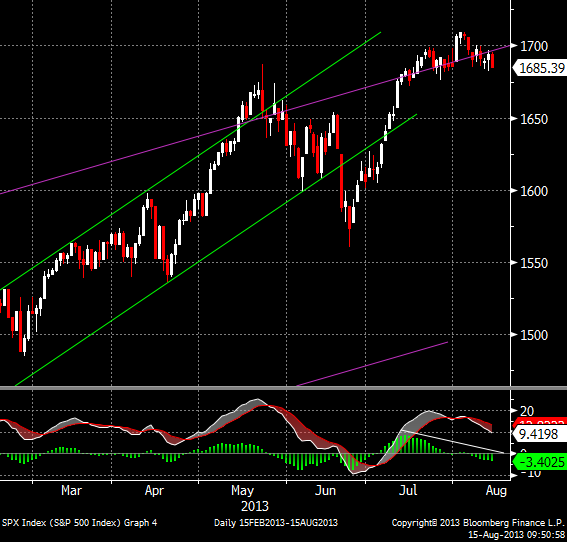 A break of 1670 (i.e. the 16th July low) would mark the first lower low and the possible start of a new downtrend - a negative development for equities. I am not calling the end of the bull market at this juncture; rather am observing that the evidence in favour of a pullback is mounting. 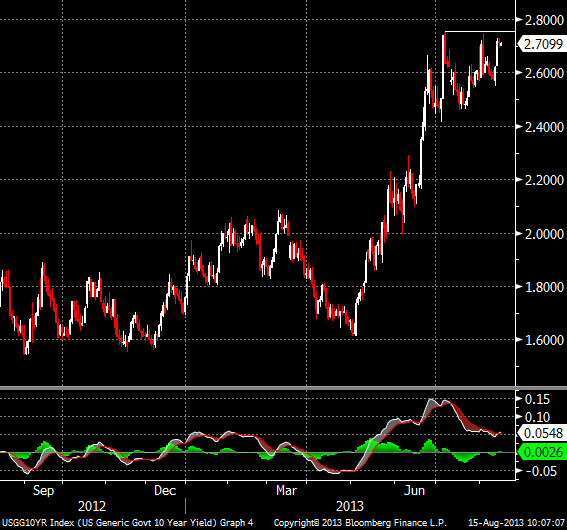 Conventional wisdom holds that "when" the Fed begins the taper next month, UST yields will break higher. This also warrants close attention. I see a risk that even "if" the Fed does begin to taper next month, we could still see 10yr UST yields pull back to ~2.15% before resuming their uptrend. 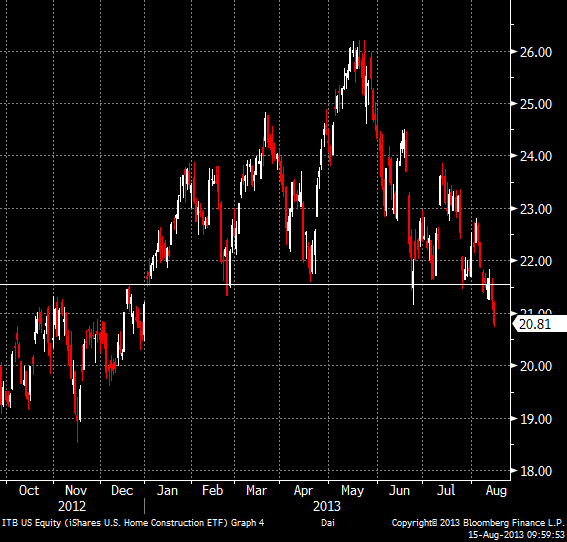 A pullback in equities/risk in general would put downward pressure on UST yields. Always be wary of conventional wisdom. 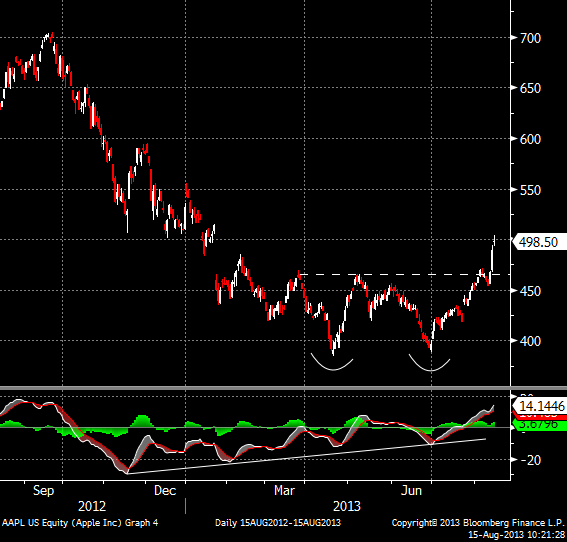 Remember the AAPL chart from my last update? Sometimes these things play out exactly as expected. Target remains $540. 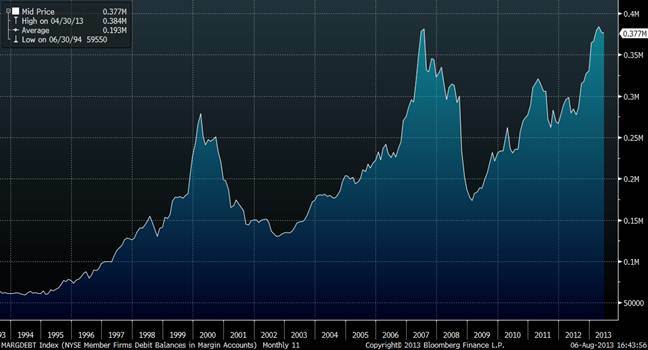 I know I said in my last post that valuations don't have an impact on the tape unless they reach extreme levels. Well, Chinese equities look extremely cheap. When you look at many of the large-cap defensive stocks in the US (e.g. Altria, AT&T, Coca-Cola, McDonalds, the utilities sector etc etc), they appear to have been trending down ever since the Shanghai Composite bottomed. Coincidence? Perhaps. However I think we are at the early stages of a shift in asset allocation away from relatively expensive US defensive stocks into relatively cheap Chinese (and other EM) stocks. In summary: US equities are due for a pause that refreshes. Remain patient but alert to opportunities in weakness. 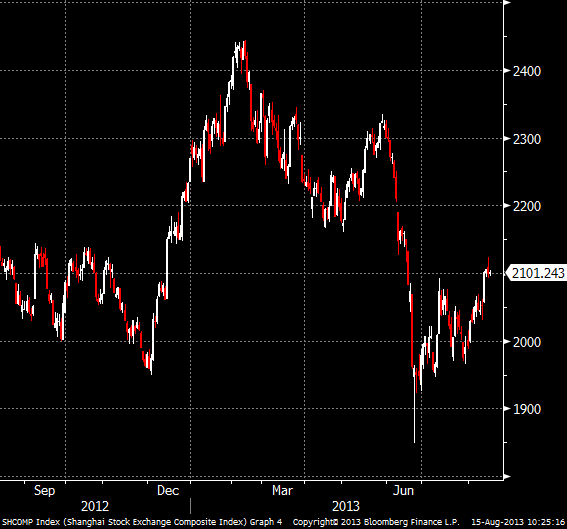 Valuations on Chinese equities look compelling and the price action is now looking more encouraging. If you are overweight US equities (particularly defensives) consider reallocating to China (and EM). Bank of America Merrill Lynch Strategist Savita Subramanian penned a research article earlier in the week that has received a lot of attention. In the article, Ms Subramanian looks at 15 different valuation metrics (see table below) for US and comes to the conclusion that "the market is trading below or in line with historical norms". It is perfectly understandable why a sell-side analyst working for a broker-dealer would be keen to justify why equities are cheap/fairly valued, particularly when equity markets (well, the S&P500) are at or near all time highs. And particularly when a significant portion of the investment community remains sceptical towards equities and believes Central Bank policy perhaps has more than a little to do with the post-crisis performance of equities. I'm not saying I completely disagree with Ms Subramanian's analysis and conclusions. The bigger question in my mind is whether the conclusions even matter, given where valuations are presently. Let's take a look at trailing PE. (I will leave forward PE alone as that is based on analysts' earnings estimates which are always wrong. We just don't know the direction in which they will be wrong - although given the consensus has not once in the past 30 years forecast an earnings recession for the subsequent year they err on the side of being too optimistic - or the order of magnitude of the error. 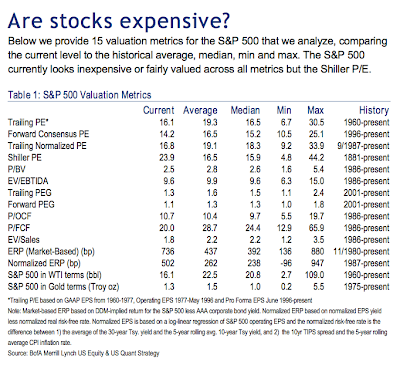 According to the table above, stocks are fair to undervalued using trailing PE. A key disadvantage of using a trailing PE as a method of market valuation is that it doesn't tell you where you are in the business cycle and therefore has very little predicative power. 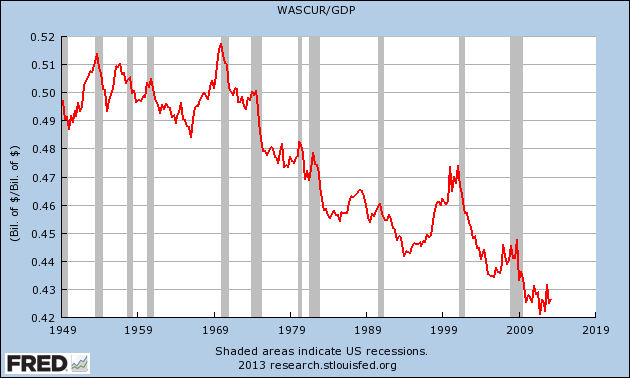 If current profit margins are unsustainable (e.g. because efficiency gains have been fully realised this business cycle) and start to mean revert, one would expect corporate earnings could start to fall unless we see a strong pickup in final demand - something that is not yet in evidence. Therein lies the danger of using the common trailing PE to assess whether stocks are cheap: there is a risk that the current trailing PE is artificially low, due to unsustainably high profit margins. 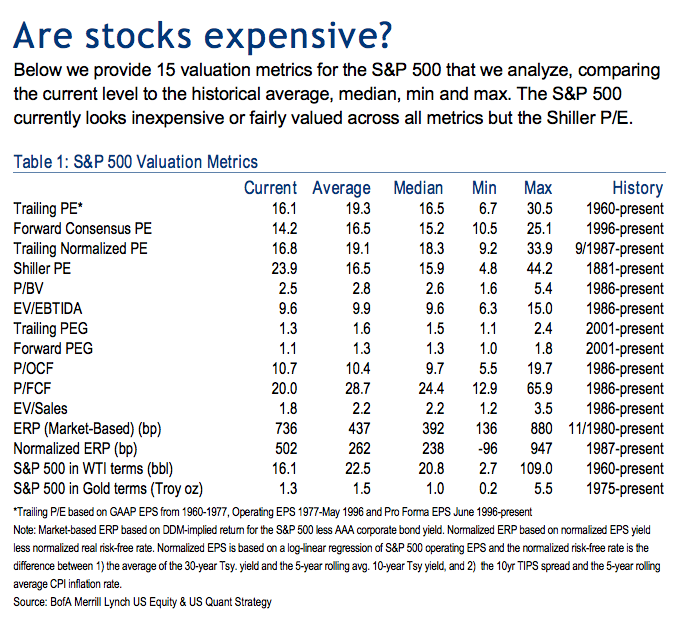 The one metric in the table above that does make stocks appear somewhat expensive is the Shiller PE (also known as Cyclically Adjusted PE, or CAPE). The current CAPE is approximately 24, on the high side of average to be sure, but then again well below its historical high. Today, the CAPE has a number of detractors. They argue that the severity of the earnings recession we saw in 2008/09 negatively skews the 10 year average earnings figure used in the calculation, thus artificially inflating the CAPE. It's true that the earnings recession was severe however I'm not so sure that means we can simply pretend it didn't happen. Furthermore, the severity of the earnings recession forced companies to slash staff/cut costs which resulted in a subsequent boom in profit margins. Which brings us back to my previous point, regarding a key shortcoming of using discreet years as the basis of PE calculation. "Not so much" is my simple answer to this question. I acknowledge that the current level of the CAPE indicates we should expect rather meagre long-term returns from the US equity market. However this does not preclude the market from rising from here - possibly substantially. I am disinclined to get bearish an up-trending market simply because it looks expensive on one valuation method. 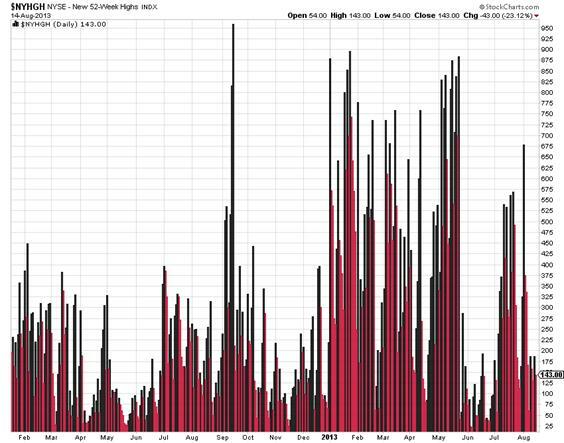 That said, I do not have a huge amount of implicit trust in buying-and-holding the equity market at these levels of CAPE and remain alert to the possibility in a change in trend. The Trailing PE has very little in the way of demonstrated predictive value of future returns. And given it is sitting darn close to the long-term average anyway, all it really tells is is that stocks could rise an awful lot or fall an awful lot from here. I am disinclined to get bullish the market simply because a valuation metric with little or no predictive capability in evidence says stocks are approximately fair value. Valuation rarely has any impact on the tape until and unless it has reached an extreme level. 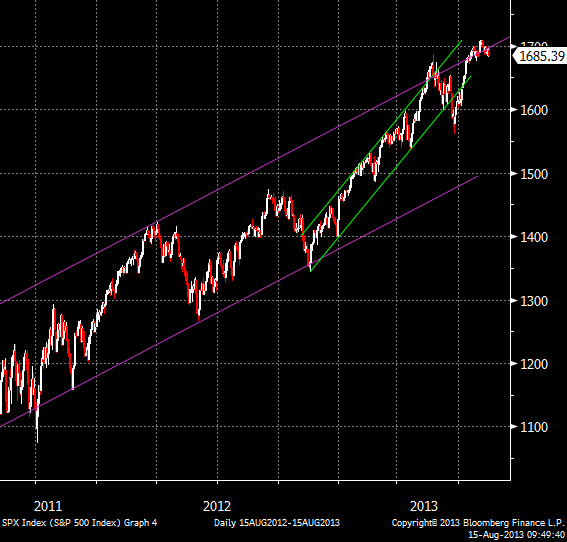 Valuations do not seem to be extreme here which indicates to me markets could move a long way in either direction. To put it another way, valuations can currently be used to justify whatever narrative the author/analyst wishes to fit them to, whether bullish or bearish. Caveat emptor. Trade well and follow the trend. Despite the taper talk the USD finished the session weaker, with relative strength seen in EUR and particularly JPY. 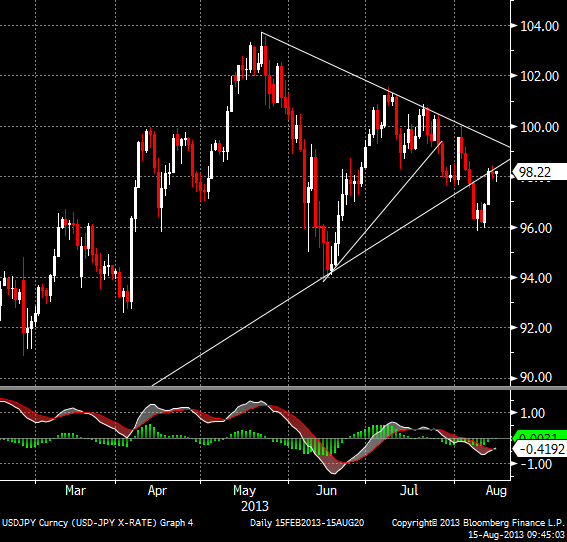 I have previously mentioned that I currently view USDJPY as a key indicator of the market’s preference for risk. Following USDJPY’s break of near-term congestion to the downside I fully expected the pair to test 97-ish (i.e. the long-term uptrend line). USDJPY is now trading below this trend line (see chart below). 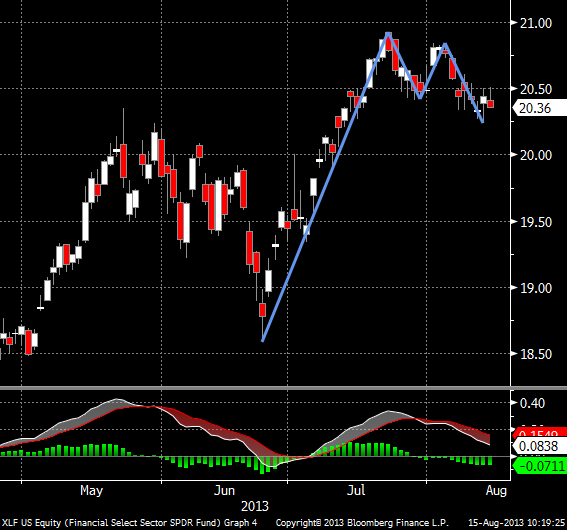 A convincing break to the downside from here will usher in a period of risk-off. There will be a lot of chatter on CNBC etc. about the “unwinding of the Yen carry trade” if USDJPY does break down. This type of chatter comes from people who do not understand what a carry trade is. 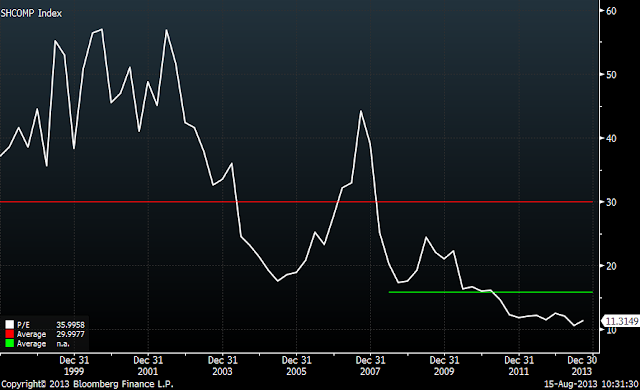 A carry trade (in FX) is where one borrows in a low yielding currency (e.g. Yen) and buys a high yielding currency (e.g. AUD) in order to generate returns from the resulting positive cashflow (termed positive carry). Interest rates in both USD and JPY are effectively zero – there is no interest rate differential that makes a “carry trade” worthwhile, particularly when you consider USDJPY volatility is currently around 12%. Heck, even if you borrow JPY at (say) 0.20% and invest in AUD at (say) 2.20%, your positive carry is only 2.0% p.a. 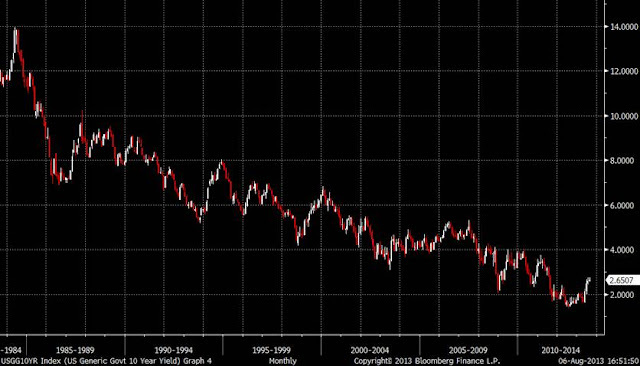 When the volatility of AUDJPY is 12.6% you are ipso facto expecting the majority of your returns to come from currency movements not positive carry (whether you realize it or not! ): Therefore not a carry trade. I still wonder quietly to myself whether the Fed is being overly transparent with respect to communications on their plans for QE. I just feel that if one day in the future we were to read the Fed minutes and learn after the fact that the Fed only bought $65 billion worth of securities instead of $85 billion the previous month – particularly if unemployment had already reached the 6.5% mark - the world and financial markets would carry on without much anxiety. Clearly the 30-odd year bull market in bonds is getting long in the tooth and I am not arguing for further strong gains in bonds here. 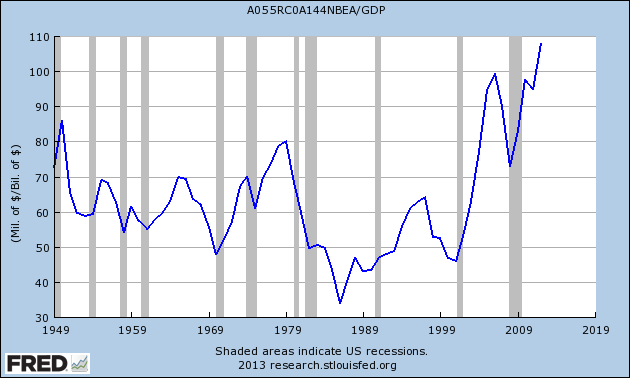 However I do think the Fed’s expectations for the US economy are rather optimistic. The consumption trends of the American consumer and indeed the ongoing durability of the investor-driven buy-to-let housing recovery we are seeing are likely to be constrained by the continuing lack of income growth experienced by the average US consumer. Further, the 9th July announcement that US banking regulators are to impose a 6% leverage ratio on the 8 largest banks will likely pose a headwind to re-leveraging (assuming there is even robust end demand for credit). 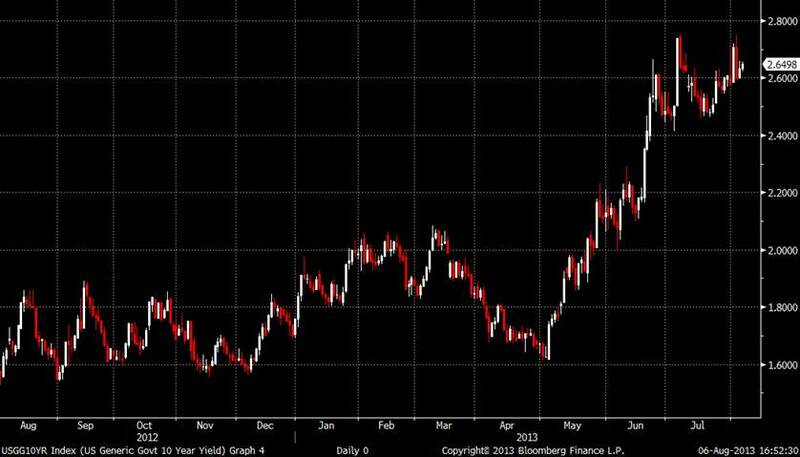 Accordingly I expect cash rates to be stuck at zero for a long time and I wouldn’t be surprised if bond yields are range bound for much longer than most currently expect. Betting on higher rates seems like the right move on a 5 year view. On a 1 or 2 year view I’m not so certain.